While many IT services can be provided behind the scenes to avoid disrupting staff’s workday, there are times when you need an IT professional on hand. This becomes particularly evident when employees need assistance and systems need repairs. When employees have IT problems or questions, who do they contact? Employees often turn to managers, especially in small and midsize businesses. The managers then need to track down someone who can help, which takes them away from their responsibilities. Meanwhile, the employees become frustrated as they wait for assistance to arrive. Worse yet, an employee might turn to a co-worker for help. When an employee is suspicious of an email attachment but a co-worker thinks it’s legitimate, the employee could end up opening the attachment and have their computer infected with malware. Potentially infecting your entire network. Having a reliable help desk can eliminate frustration and lost productivity. Our experienced technicians can assist your team with technical problems so they can get back on track quickly. This level of support is typically available 24/7. When employees contact the help desk, the level 1 technicians gather and analyse information about the employees’ problems to determine the best way to solve them. Common issues that fall into this level of support include resetting passwords resolving basic network connectivity issues and troubleshooting email problems. If the technicians cannot solve a problem they reclassify it as a level 2 issue. Level 2 technicians handle more challenging problems such as troubleshooting software and computer meltdowns. After an investigation, the technicians will determine whether it is a known or new issue. When it is a known issue, they look for solutions in the help desk database. If it is a new issue they might try to resolve the problem on their own or they might reclassify it as a level 3 issue. Problems escalated to level 3 are more complicated and thus difficult to solve. The problems often lie within the IT infrastructure. Sometimes level 3 support is handled by networking specialists. Not all help desks provide level 4 support. This level of support is reserved for extremely complex problems involving multiple vendors, products or tools outside of the organisation. There is no doubt that having a help desk is advantageous. However, maintaining one in-house is expensive and out of reach for most small to midsize businesses. When that is the case a cost-effective solution is to use a managed help desk. We can provide you with a professionally staffed IT help desk that will produce quick and courteous assistance to your employees when they need it. Some computer and network management tasks need to be performed in person. For example, replacing a failing hard drive and setting up a wireless router requires the human touch. Having an IT expert onsite is also helpful when conducting vulnerability assessments, educating employees about security threats, and solving complex IT problems. Our support services can include on-site help with a friendly, personal touch. Having IT professionals readily available is important in ways that go beyond being convenient. Waiting for someone to resolve problems or provide onsite support leads to lost productivity which hurts profitability. It can also lead to frustrated employees who might try to fix a glitch themselves and inadvertently turn a minor issue into a major problem. With our help desk and onsite support services you do not have to wait. We will be there when you need us. Contact a member of our team today. 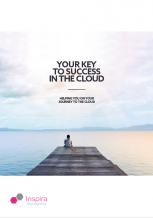 Enter your details here to download our free cloud services guide. It's full of helpful information all about how you can make the move to the cloud. You will be redirected to your copy of the guide once you've submitted the form. Thanks! You'll be redirected to your copy of the guide now. If you have any questions after reading our guide please don't hesitate to get in touch.